Also serving communities of Broussard, Youngsville, Sunset, Abbeville, Crowley. There are 9 Assisted Living Facilities in the Lafayette area, with 7 in Lafayette and 2 nearby. The average cost of assisted living in Lafayette is $3,212 per month. This is lower than the national median of $3,346. Cheaper nearby regions include New Iberia with an average starting cost of $2,515. To help you with your search, browse the 48 reviews below for assisted living facilities in Lafayette. On average, consumers rate assisted living in Lafayette 4.3 out of 5 stars. Better rated regions include New Iberia with an average rating of 4.9 out of 5 stars. Caring.com has helped 8 families in Lafayette find high-quality senior care. To speak with one of our Family Advisors about assisted living options and costs in Lafayette, call (855) 863-8283. Often called "The Happiest City in America," Lafayette, La., has a diverse cultural history that is apparent in its language, food, and music. Seniors exploring the town may hear people speaking Creole, may smell the aroma of étouffée and may hear Zydeco echoing in the streets. Senior citizens who need a little extra help with daily tasks will find six assisted living facilities in the Lafayette city limits and six others in the neighboring communities, including Sunset, Breaux Bridge, Youngsville and Broussard. Assisted living facilities in Louisiana are regulated by the Louisiana Department of Health. There are four levels of adult residential care providers, depending on the number of residents and level of care. Residents of Lafayette enjoy mild winters and hot summers. Highs in July, the warmest month, average around 91 degrees. The lows in January, the coldest month, average 41 degrees. There is the possibility of hurricanes from June through November. Seniors with respiratory problems might have more trouble in Lafayette than in other places around the nation. The air quality ranking is 50 out of 100, with 100 being the best. The national average is 58. The cost of living in Lafayette is 6.90 percent lower than the national average. Seniors might appreciate the lower cost of healthcare, which scores an 87 out of 100, meaning that it is below the national average. The Lafayette Transit System runs from 5:45 am through 10:30 pm daily. Seniors qualify for a discounted pass or a reduced day fare. The LTS is closed on government holidays, so other arrangements need to be made on these days. The Lafayette Senior Center has a host of programs for seniors in the area that are held across three facilities. These include the Senior Art Studio, the Rosehouse, and the Greenhouse. Various festivals, Vermillionville, Acadian Village and the campus of the University of Louisiana at Lafayette all have activities and events that appeal to seniors. Lafayette is home to world-class medical facilities, including Women’s and Children’s Hospital, University Hospital and Clinics, and Lafayette General Medical Center, in the event of medical emergencies or illnesses. Assisted Living costs in Lafayette start around $3,212 per month on average, while the nationwide average cost of assisted living is $4,000 per month, according to the latest figures from Genworth’s Cost of Care Survey. It’s important to note that assisted living rates in Lafayette and the surrounding suburbs can vary widely based on factors such as location, the level of care needed, apartment size and the types of amenities offered at each community. People who need assistance paying for assisted living might be able to turn to the Long Term Personal Care Services Program and the Home and Community Based Services Medicaid Waiver. To see a list of free assisted living resources in Lafayette, please visit our Assisted Living in Louisiana page. 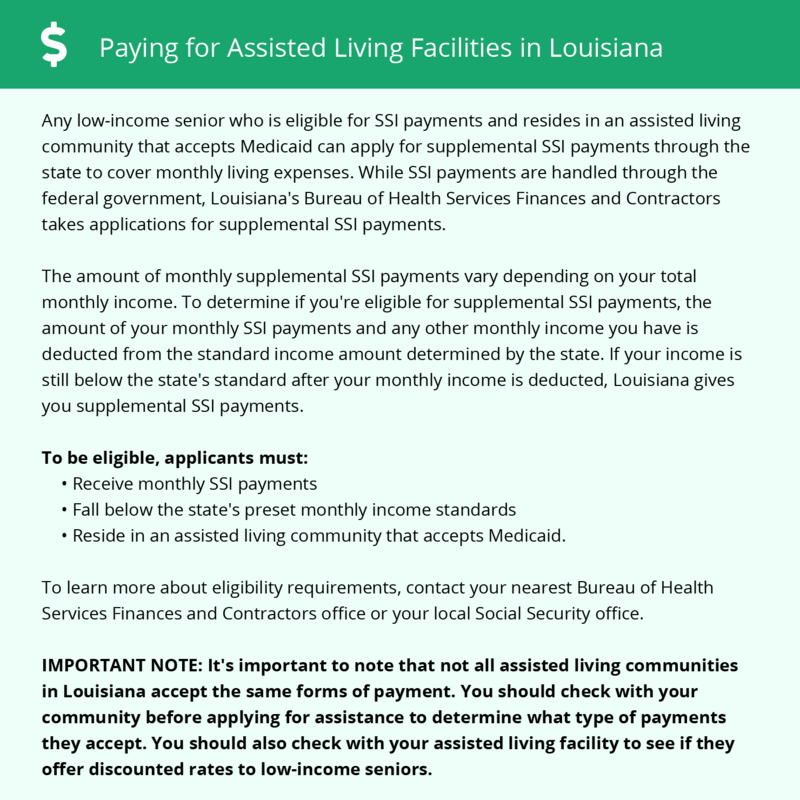 Lafayette-area assisted living communities must adhere to the comprehensive set of state laws and regulations that all assisted living communities in Louisiana are required to follow. Visit our Assisted Living in Louisiana page for more information about these laws.